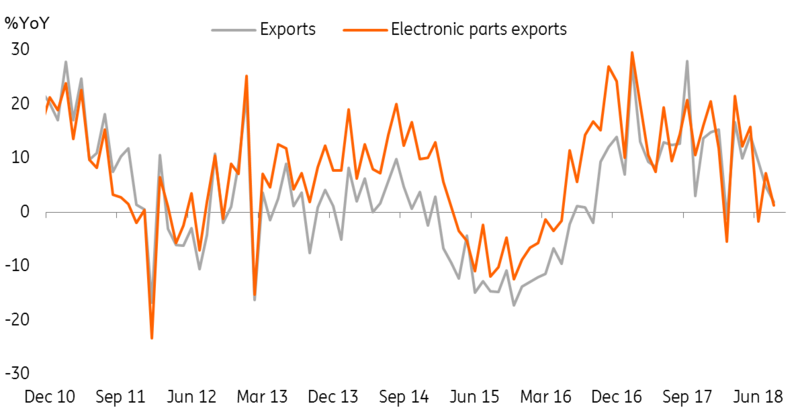 Taiwan's exports grew at a mere 1.9% year on year, and electronic parts were even slower at 1.3% - and this could potentially be a direct result of the supply chain damage caused by the bilateral trade war between the US and China. 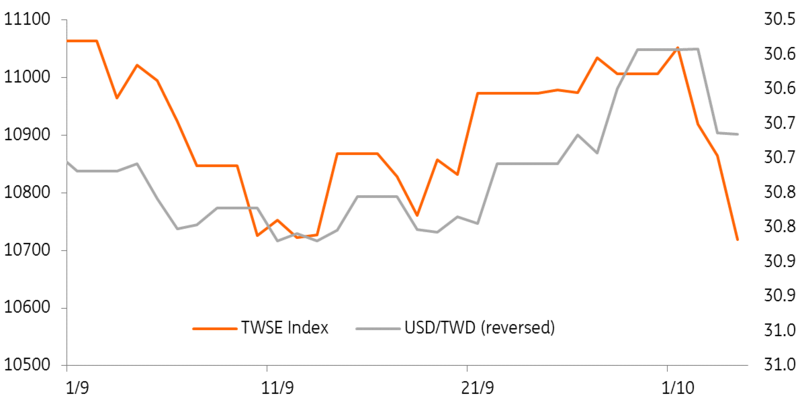 This has led to a sell of equities (as Taiwan's stock market has fallen by 4.84% since 1 October) by foreign investors and pushed the Taiwan dollar against the USD weaker by 0.96% since the end of September 2018 (Spot 30.835). The central bank of Taiwan can do very little to help the currency. Inflation in terms of CPI was mild at 1.72%YoY but higher from last month's 1.5% - mainly a result of higher energy prices. The same was the case for wholesale price index but manufacturing fatigue lead WPI inflation lower to 6.55%YoY from 6.83%. The chance of a rate hike is small with such mild consumer inflation, which means the currency is likely to continue to weaken against the US dollar. The policy rate at 1.375% and it would be too early to slash rates just yet. The central bank needs to save that option in case the economy weakens further. This is only the beginning of the China-US trade war, and as we can see, Taiwanese companies providing supply chain products and services are likely to get hurt, and the Taiwan dollar could continue to weaken. Taking into account the trade war impact, we maintain our forecast of 31.0 by the end of the year.